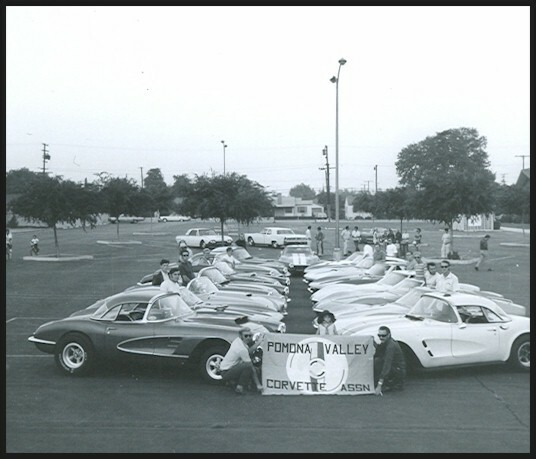 Pomona Valley Corvette Association (PVCA). Founded in 1962, we are the Inland Empire’s oldest Corvette owner’s club. Make sure you check out the historical 1970 photo below. We exist for one simple reason: to bring owners of America’s Sports Car living in the Inland Empire / Pomona Yalley area together in a manner that enhances the Corvette experience for all. Pomona Valley Corvette Association also organizes a monthly event, which is usually social in nature. Typical of our events are: a spring road trip to Kernville; group attendance at the region’s largest Corvette gathering, “Big Bear Bash”, held each June; a Fourth of July pool party; a Halloween party and an annual Awards Banquet in December. Rotolo Chevrolet in Fontana California sponsors the Pomona Valley Corvette Association. Members receive a discount on GM parts purchased from our sponsor. Ownership of a Corvette, a valid USA Driver License and car insurance is required for membership. Attendance at three General Membership meetings as a guest is necessary prior to induction. Get a new members packet online. We are looking for historical PVCA photos. If you have any pre-2000 please let us know. Please contact our President Thanks! The color photo above has been provided by Jeff Buttler a PVCA member from the 1970’s. He owned the 1969 LeMans Blue coupe with the white stripes. It is the Corvette in back pointing toward the camera. Both photos were take at the same Church parking lot, by two different photographers. Thanks Jeff for the historical information.